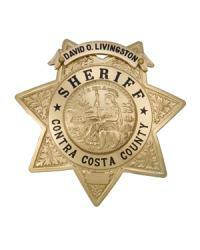 The Contra Costa County Office of the Sheriff is the largest law enforcement agency in Contra Costa with over 1,100 sworn and professional employees dedicated to providing the highest level of law enforcement and customer services. The Office of the Sheriff offers a full range of services to over 1,000,000 residents in the 715-square mile county. The duties and mission of the Sheriff’s Office are unlike most police agencies. Responsibilities include unincorporated area policing, contract cities (Danville, Lafayette, and Orinda) and special districts, air support (helicopters), marine patrol, dispatch, investigations, coroners, county detention facilities, custody alternative, court security, forensic services, police academy, and Office of Emergency Services.